This week is all about several things: July 4th, Game of Thrones, Shark Week, and NEW handmade stuff. Whether you’re on the couch or behind the grill (or both) we’re here to support you. 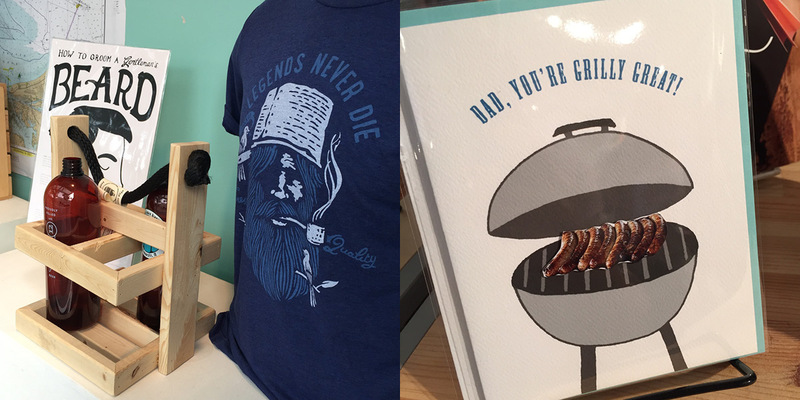 Shirts from Nicole’s Threads, grill apron by Artgoodies, and delicious grilling supplies from Best Boy & Co. 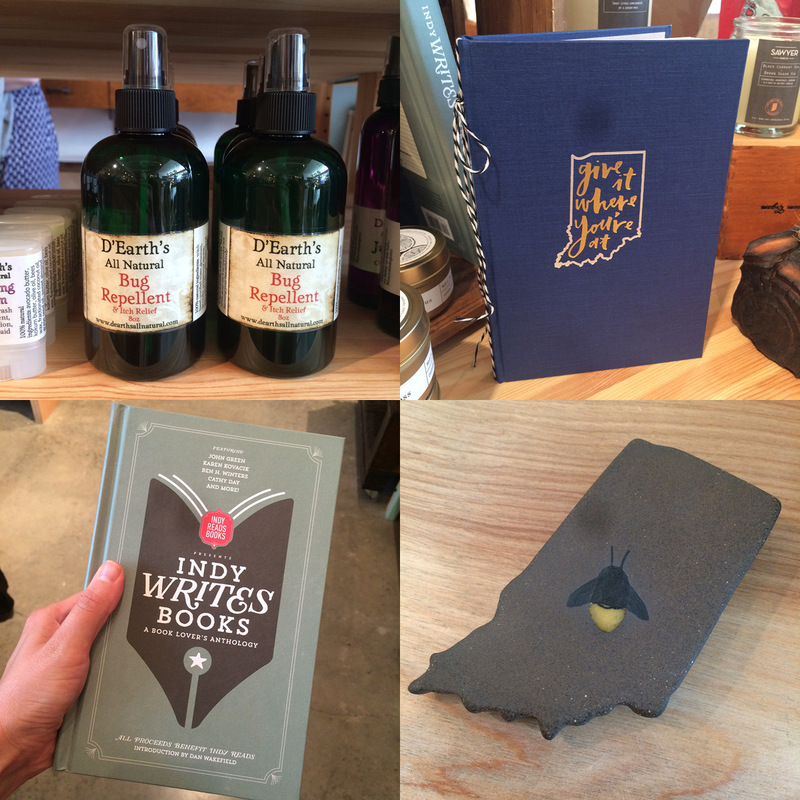 Check out a list of local events happening here in Indy here. 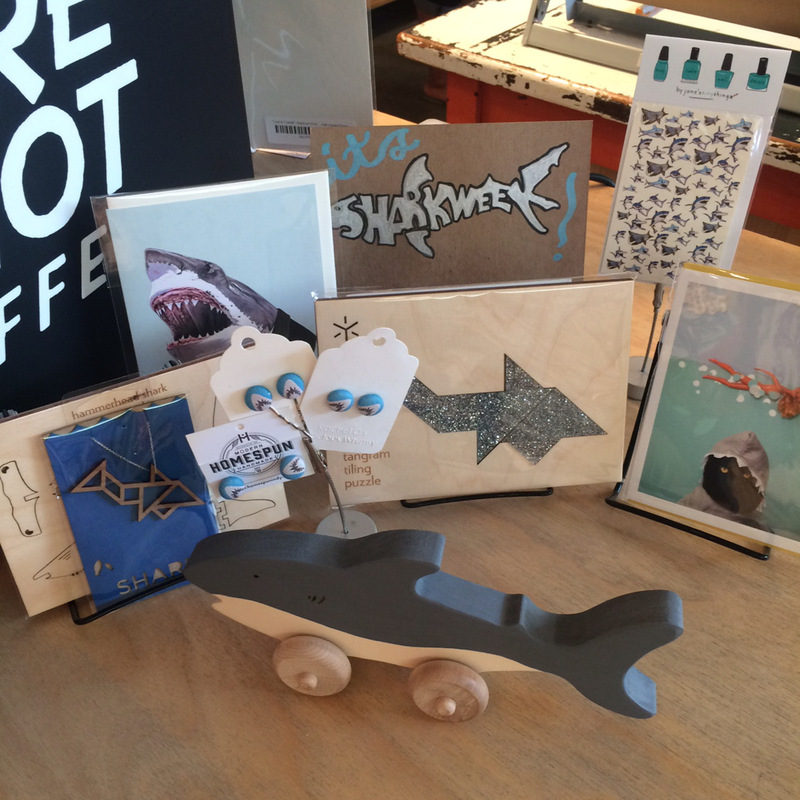 From Shark Week to GOT, we’ve got the goods. 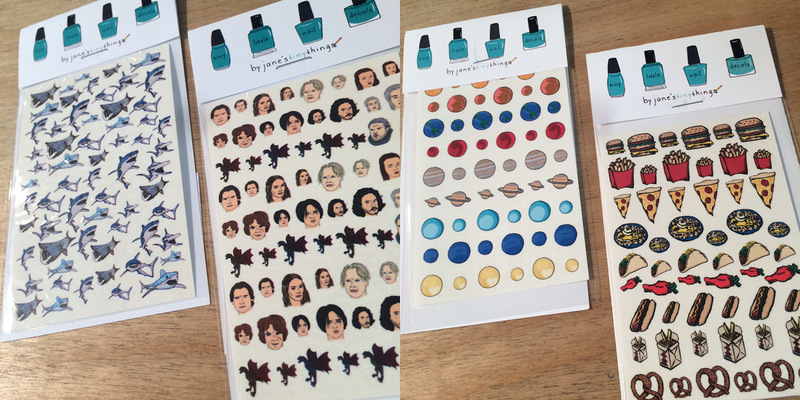 Nail decals by jane’s tiny things. 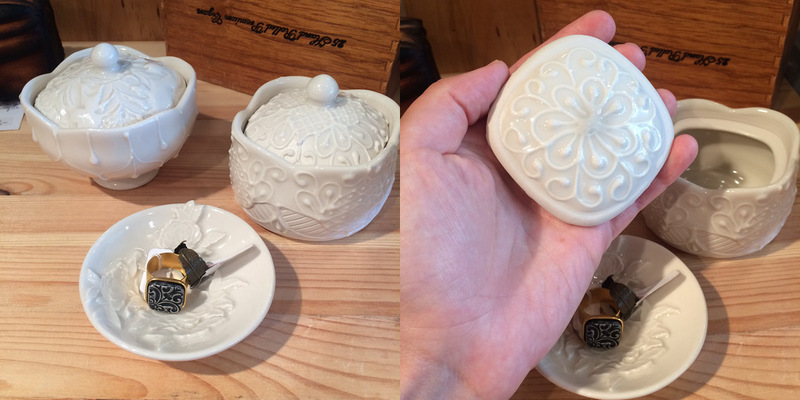 I am so obsessed with the new work from Staci DeBolt Pottery! Seriously. I want it all. 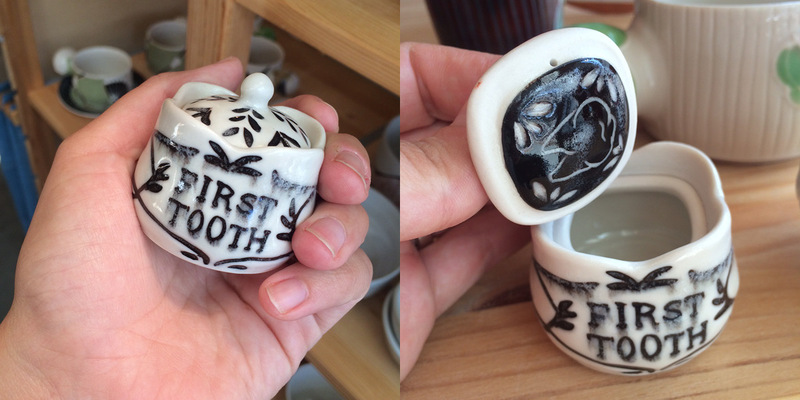 Look at that little First Tooth holder! Restock and a few new pieces from Oceanne. 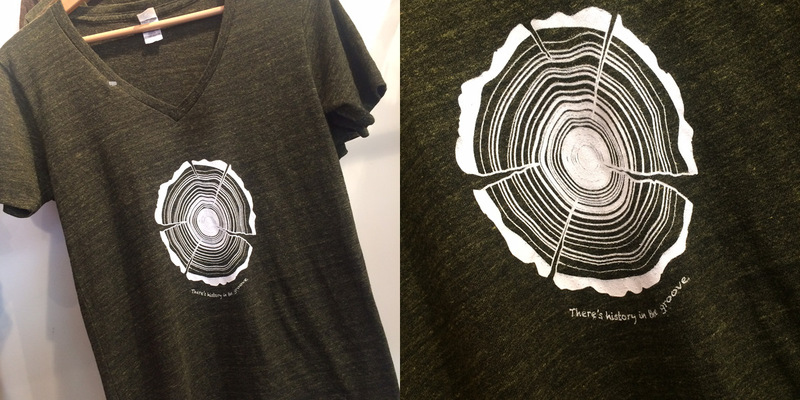 “There’s history in the groove.” Tee by new vendor Fresh Camp. 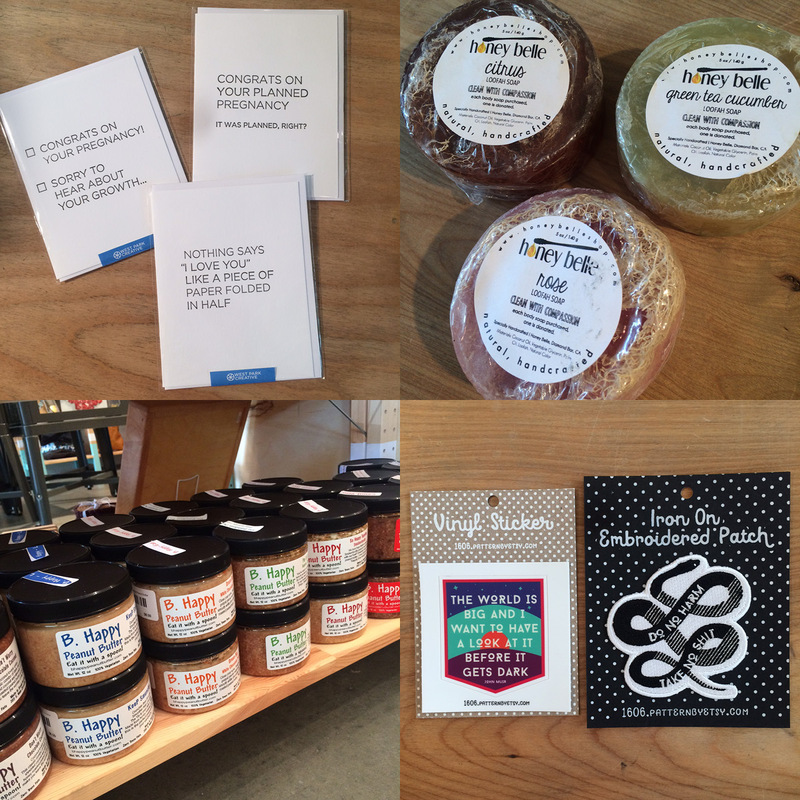 Hilarious new cards from West Park Creative, new loofah soaps from Honey Belle, vinyl stickers and patches by 1606, and PEANUT BUTTER (!!!) on the shelves from B. Happy Peanut Butter. 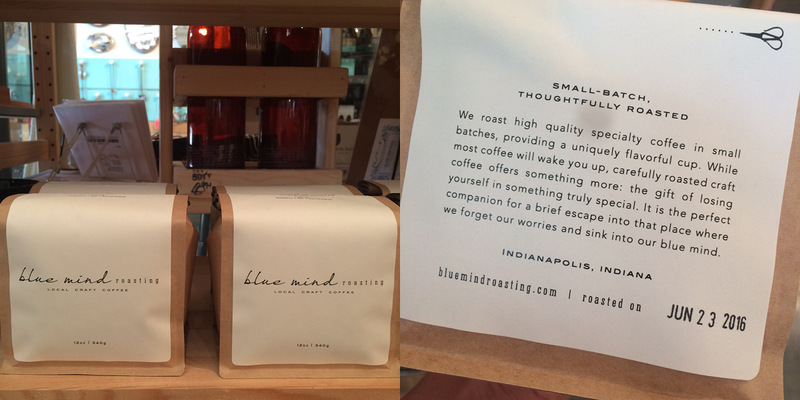 And we’ve got more coffee from local Blue Mind Roasting. Beautiful new signs by Marla and Leslie. 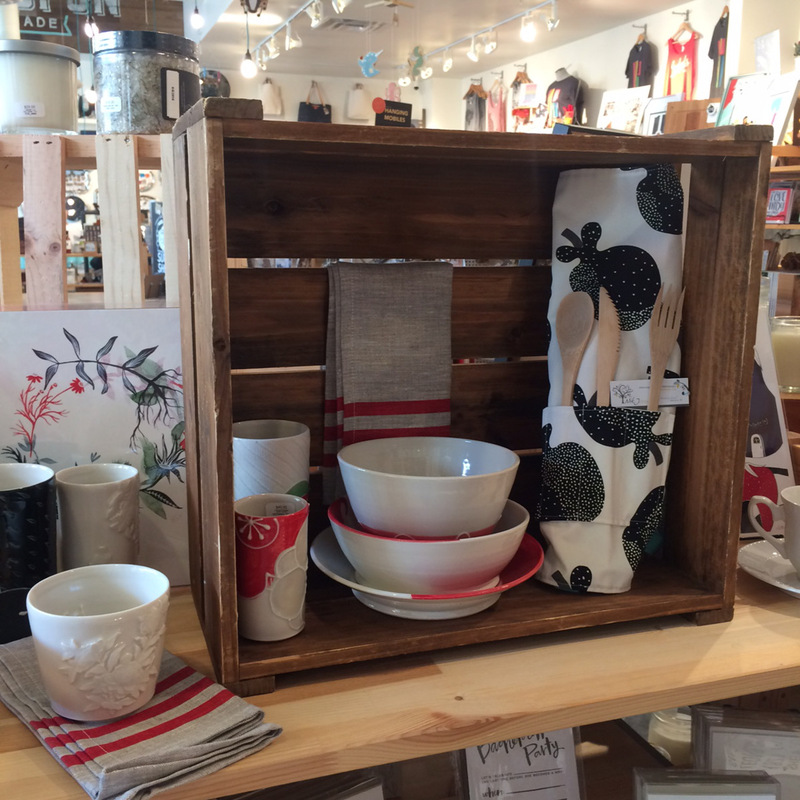 Thinking about summer picnics with this lovely display by Mark! 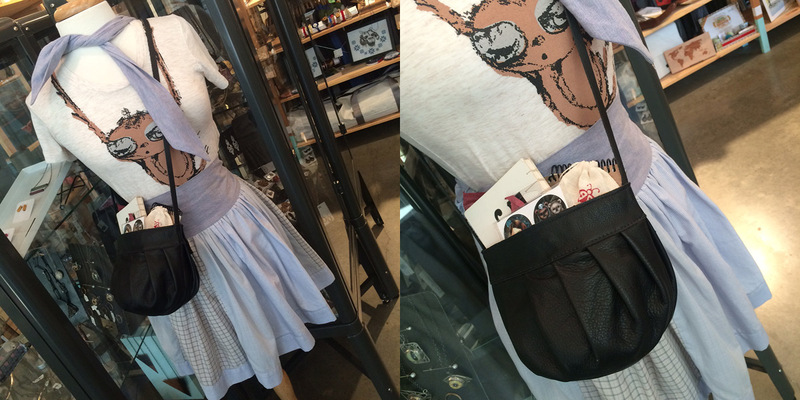 Loving our new look in skirt by Liz Alig, tee by Megan Lee Designs, and purse by ReFind Originals. 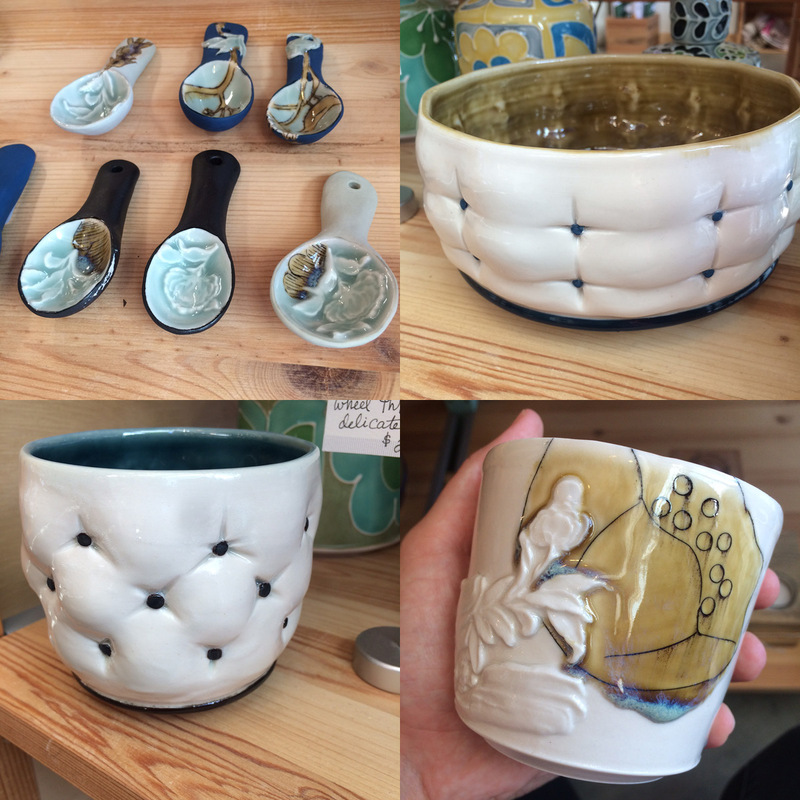 First Friday Celebration: Savannah Norris: Friday, July 1st, 6-9pm: Every month Homespun: Modern Handmade hosts a celebration in collaboration with iDADA’s First Friday events. Our shows change every other month with various artists showcasing work in painting, illustration, photography, ceramics, and so much more. 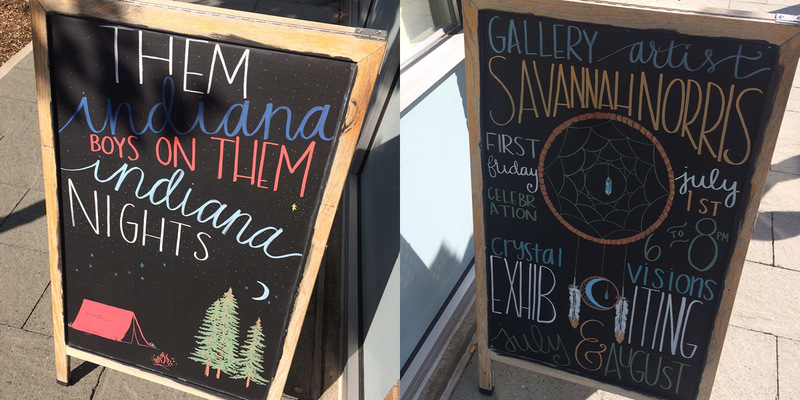 For the months of July and August, Homespun will be showing the work of local artist Savannah Norris. Savannah is a freelance stylist and a former student of the Art Institute of Indianapolis. A jack of all trades, Savannah has experience as a seamstress, illustrator, designer, carpenter, and palm reader. We’ll be showing her dreamcatcher pieces in the store as well as featuring a large installation of Savannah’s in our shop window. Workshop: Mixed Media Junk Journal: Friday, July 8th, 6-8pm: Do you ever feel like you have artists’ block? Maybe you’re an out-of-practice creative wanting to get back in the habit? Perhaps you have the creative spark, but you’re not sure where to start? We’re here to help! Join our Mixed Media Junk Journal Workshop to get your creative juices flowing. Play and explore design ideas through a variety of materials and mediums. Participants will first create a handmade book from recycled materials, found papers, or ephemera. Next, instructor Tori Weyers will guide participants through creating a mixed media spread using various paints, inks, pencils, crayons, washi tape, stencils, marks, graphite, and more. Workshop: Wire Wrapping Basics: Saturday, July 23rd, 1-4pm: Have you ever wanted to go on a gem hunt? Well, here is your chance! Rana Salame Striedinger of Salame Jewelry Designs is opening her treasure chest of gemstones for you to peruse and select from to create your own one-of-a-kind jewelry. Students will learn several wire wrapping and jewelry assembly techniques to create two unique items – students can choose to make a pair of earrings and a necklace, two pairs of earrings, or two necklaces. Today it’s all about cold brew. Why cold brew? As this in depth article from Tech Insider explains, “cold brew is taking the world by storm because it often has a deeper, less acidic and more subtle taste, and is more concentrated than conventionally-brewed coffee.” Also: its great for hot Indiana summers, lasts 2-4 weeks in the fridge, and has a variety of applications. 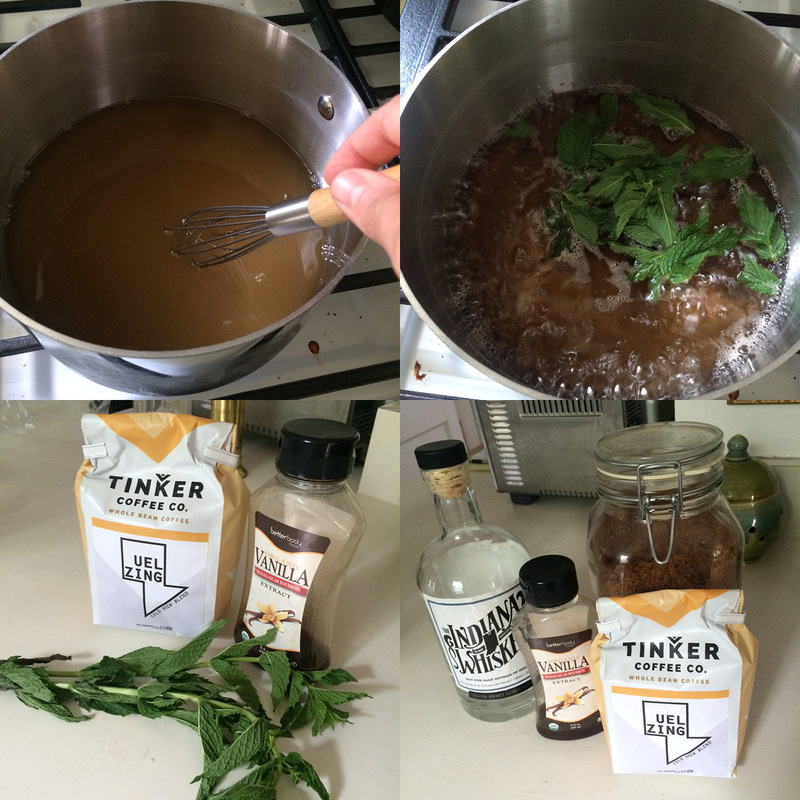 You can make a big batch ahead of time and serve for a unique addition to your next BBQ. Today I will be making 6 different cold brew coffee treats: regular cold brew iced coffee with simple syrup, iced cold brew with vanilla mint syrup and cream, Vietnamese iced coffee, whiskey coffee, coffee ice cubes, and coffee pops with cream. 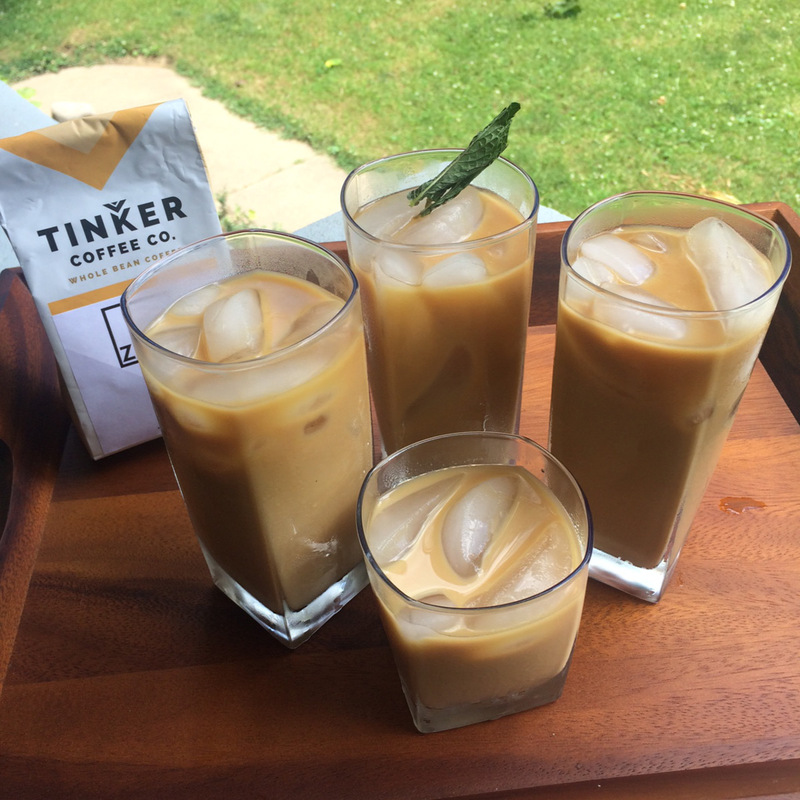 To create all these drinks I have on hand a very special blend of coffee made by a very special blend of Hoosier roasters: Tinker Coffee Co. of Indianapolis and Uel Zing of Bloomington. 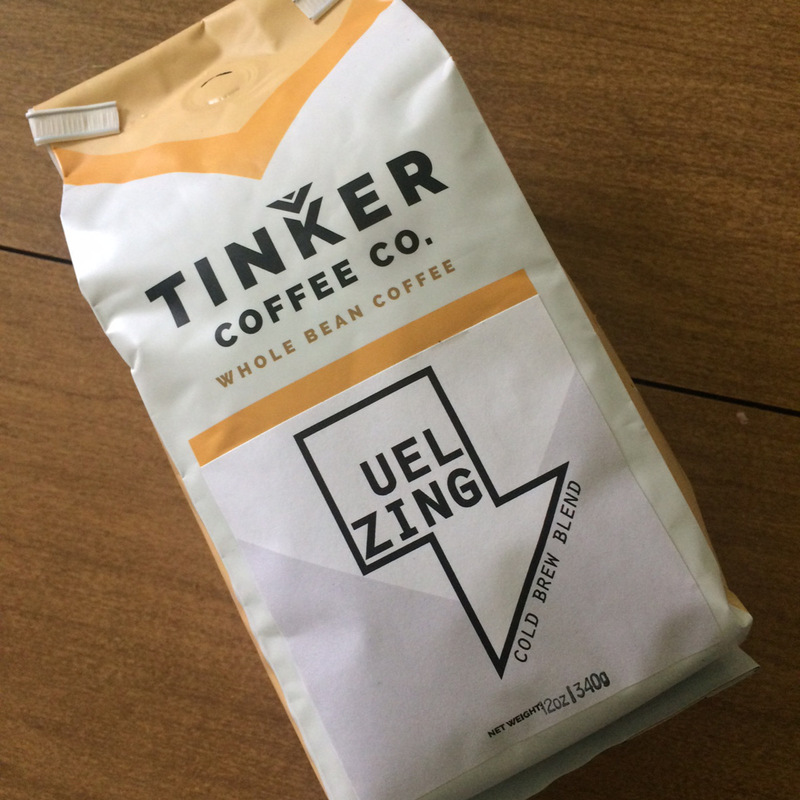 They’ve teamed up to create this cold brew coffee blend, the Zing Blend, which is a signature blend of chocolatey Nicaraguan beans, berry-sweet Ethiopian, and smoky Sumatran. 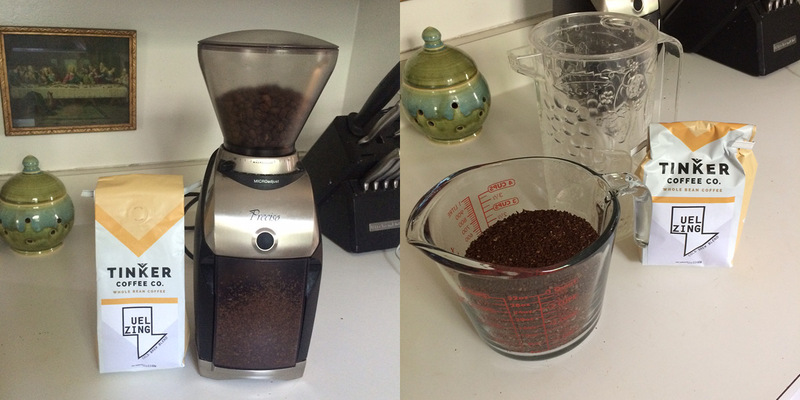 Great for any brewing method, perfect for cold brews. The back of the bag recommends 12 oz of coarsely ground coffee (one bag) to 9 cups of cold water. Just stir these together, allow to brew for 24 hours, then strain with a fine mesh strainer or cheese cloth. 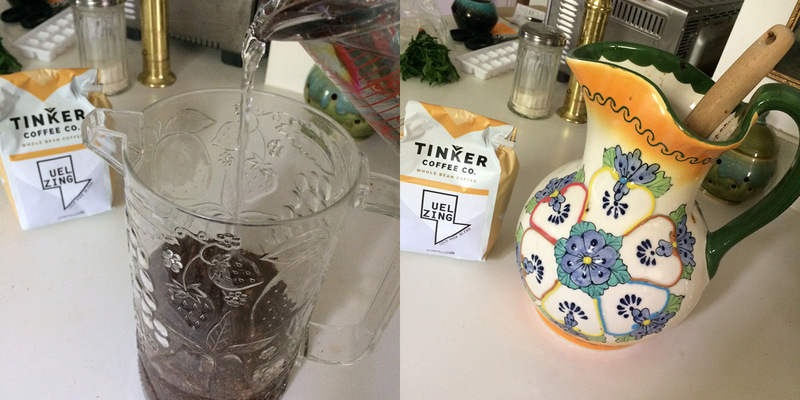 As I began to pour in the water I realized was going to need a much bigger pitcher. So instead of my adorable clear vintage fruit pitcher I wanted to show ya’ll I had to pull out this… colorful one. Let’s just say, we didn’t register for that. After I got my coffee a-brewing I started up on my syrup selections. I start out with your basic simple syrup: 1:1 water and sugar, heated just until the sugar dissolves. Mine looks brown because its ORGANIC, ok? I put a bit of the plain simple aside and start on the vanilla mint. The recipe is here, but I basically just added a bunch of mint leaves and poured out a splash of vanilla for my homies (cause who has vanilla beans?). I set the rest of that aside, and began on the whiskey syrup. This one you should follow the recipe, and its totally amazing. Not immediately after that but I did wait all night to stir up these delicious concoctions and it was hard to do. 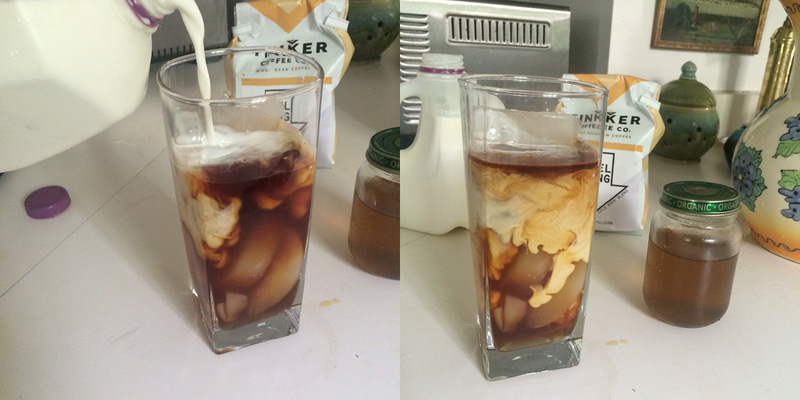 This is the only drawback to iced coffee, which is actually totally worth it because the pitcher lasted in my fridge for the week. 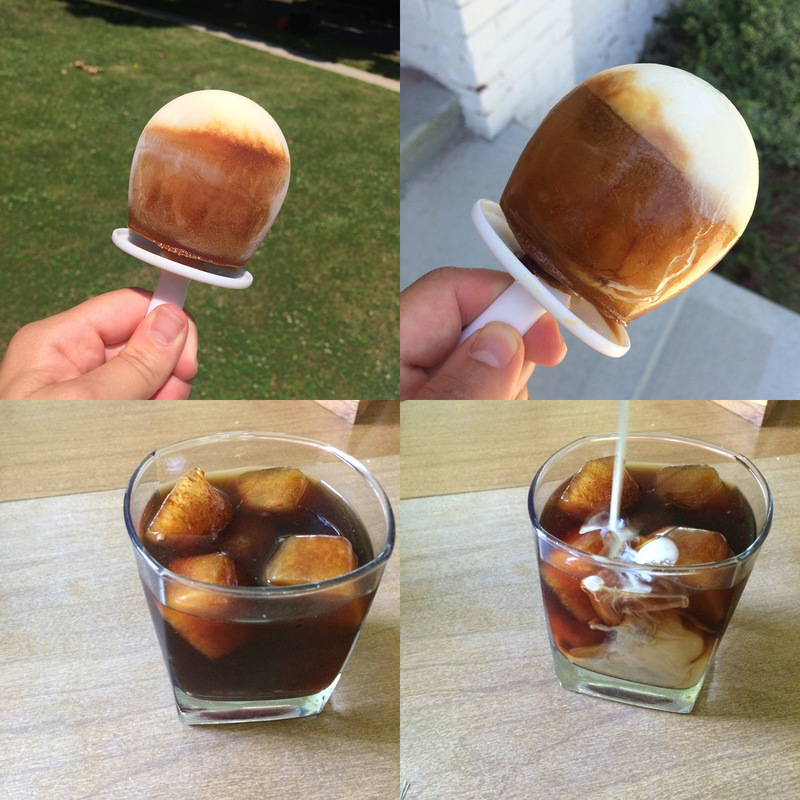 So the next day I got the coffee strained and started the popsicles and coffee cubes first. I poured some of the plain iced coffee into the ice cube tray (don’t make fun of my wee little one) and popped it in the freezer. 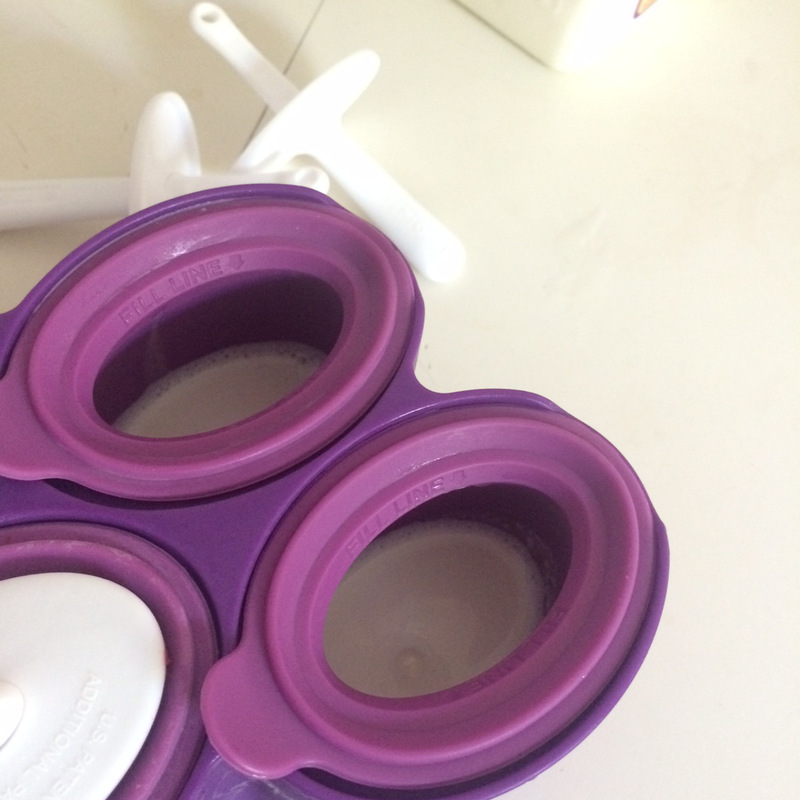 Then I threw some half and half and sugar together in a jar, shook it up, and poured some into my popsicle molds. This needs to freeze for about an hour before adding the next layer of coffee. Then I decided to get a pure taste of this iced coffee with only simple syrup and cream. I add about a tablespoon of the simple syrup and a good dose of half and half (gotta love the swirls) and give it a stir. Did you know chop sticks are perfect drink stirers? They are. Ladies and gentlemen, this coffee is DELICIOUS. No bitterness here, coffee doubters. This is sweet and creamy and luscious. Seriously. I’m sold on this. And I’m not sleeping tonight. This might be a problem. Next up, Vietnamese coffee. 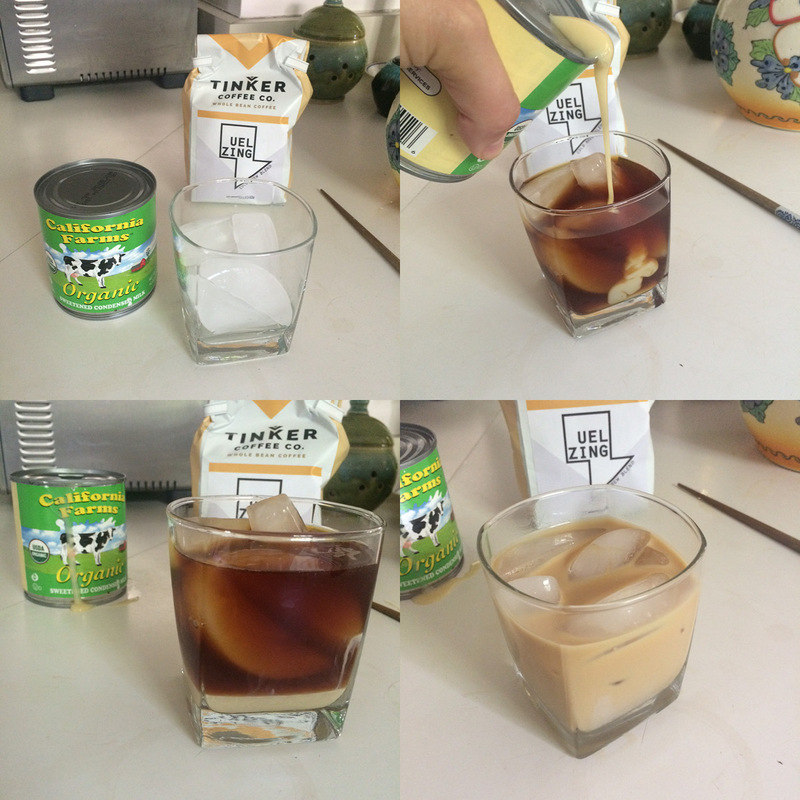 This is just iced coffee (or hot) mixed with sweetened, condensed milk. Um, have you tried condensed milk? It is thick and creamy and I can tell from my taste test that this is going to be a treat. And it is. Look at those ribbons! I stirred for a while to get the thickness mixed up, but I wasn’t going to be too mad if I had a sweet treat at the bottom of my glass. This stuff is delicious and so easy. Yum. 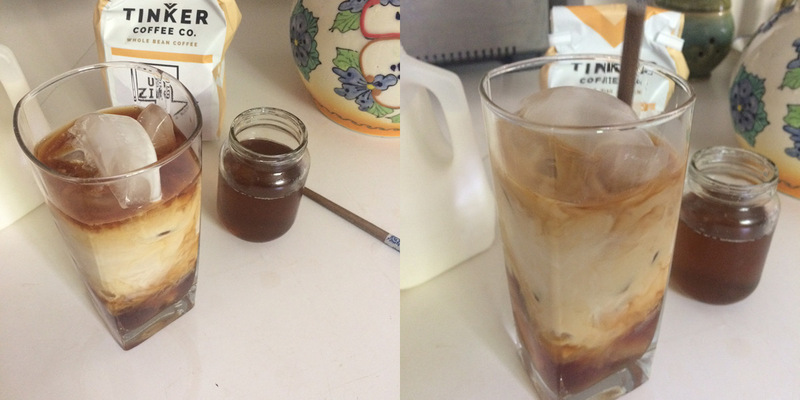 Now I mix up an iced coffee sweetened with the vanilla mint syrup. Yes, it it delicious. Subtle mint flavor, nice sweet vanilla. It feels so fancy! Especially if you add a sprig of mint to the top. Refreshing too. Okay, I saved the one I’m most excited about for last. The whiskey coffee! 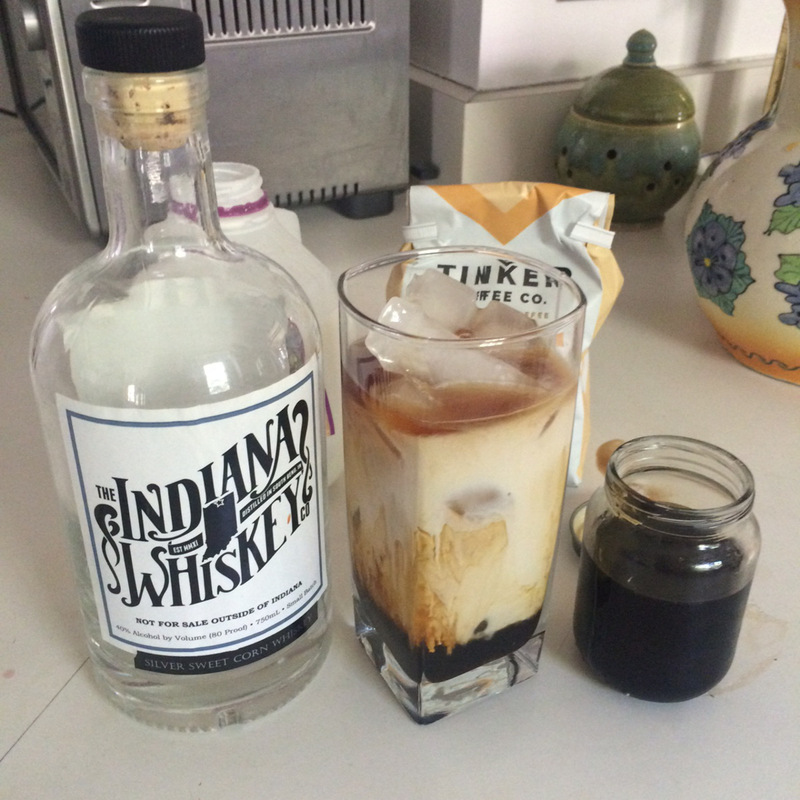 It goes as follows: about 8 oz of coffee, 2 tbsp whiskey syrup, 1 tbsp real actual fresh from the bottle whiskey, and 3 tbsp of cream. If you’re feeling like you really, really need a treat add some whipped cream and cinnamon to the top. This syrup is dark, thick, and smells fantastic. I give it a sip and… WOWZA. This is my favorite. First of all I feel like I’m drinking a milkshake. It is so rich, sweet, and oh my gosh whiskey. Here I am in my kitchen drinking dark brown sugar whiskey coffee while my toddler naps and no one is bothering me: all I do is win win win. You gotta make this. Let’s not forget about the popsicles and ice cubes! Look at that frosty goodness. This treat was so worth it. And there you have it. If I had even more ambition and even stronger nerves I would have also made some iced red eye chai with SoBro Cafe’s home-brewed Impeccable Chai. 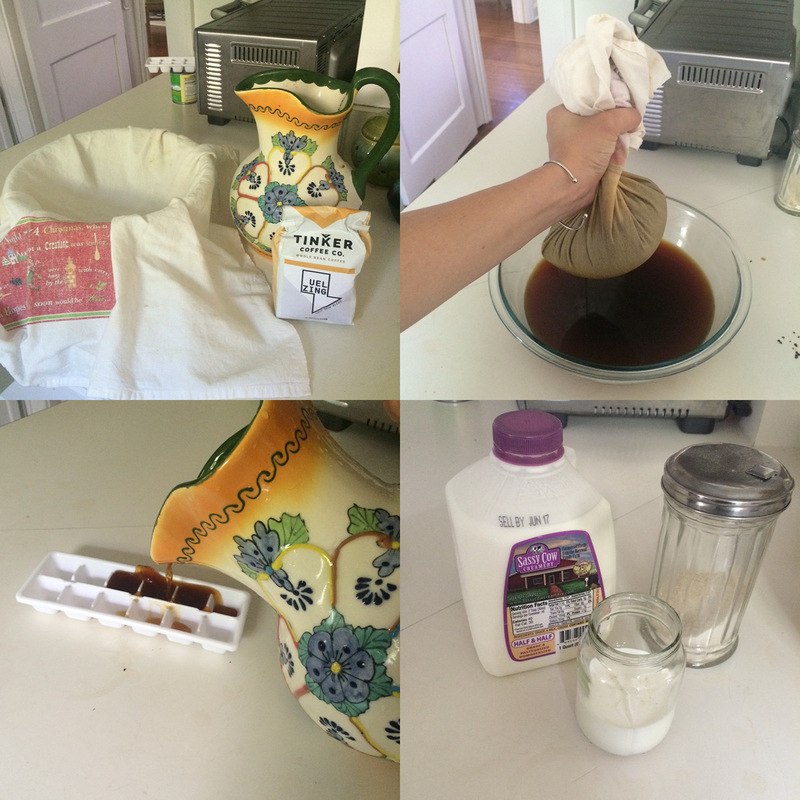 There are just so many ways to utilize this delicious cold brew- its a time saver, too. Just brew, then pour and serve for the rest of the week. Basically, I love everything about it. Hope to see your sweaty brows out on Mass Ave. this summer! 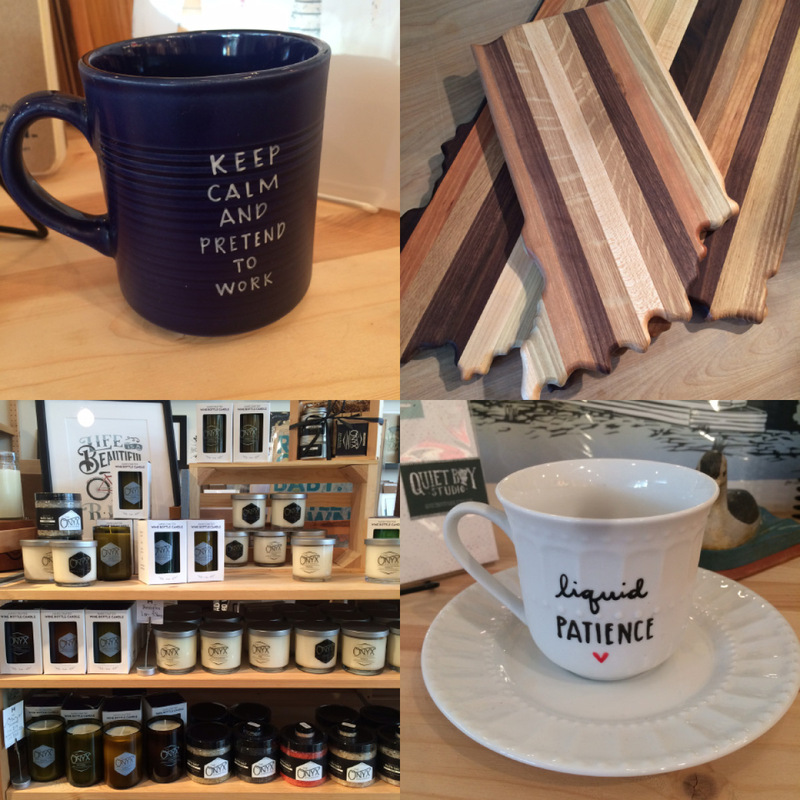 Stop by Homespun and pick up some coffee and other cool goodies while you’re out. Jam! We have the coolest workshop coming up this weekend! I’m ready to get out into nature and pick some delicious fresh blackberries and mulberries and make them into jam. Bring your kiddos, your friends, your family and head on out to Anderson, IN for a very special day of picking and preserving. Learn more about the event, coming up THIS Friday, here and sign up before it’s full. 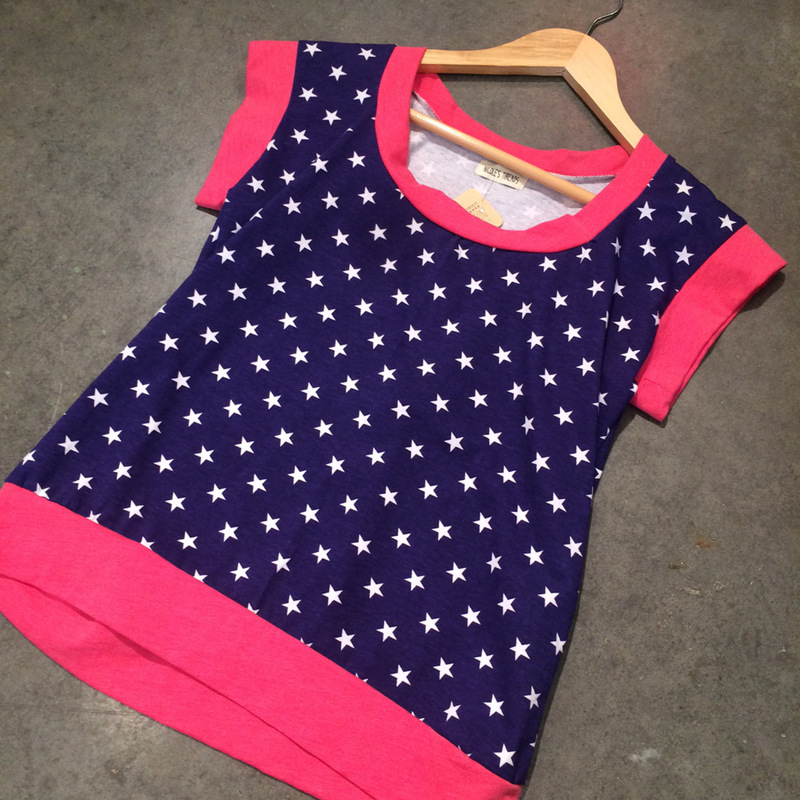 We have so, so many fun new products, too. Take a look and see you Friday! These are my new absolute favorite. 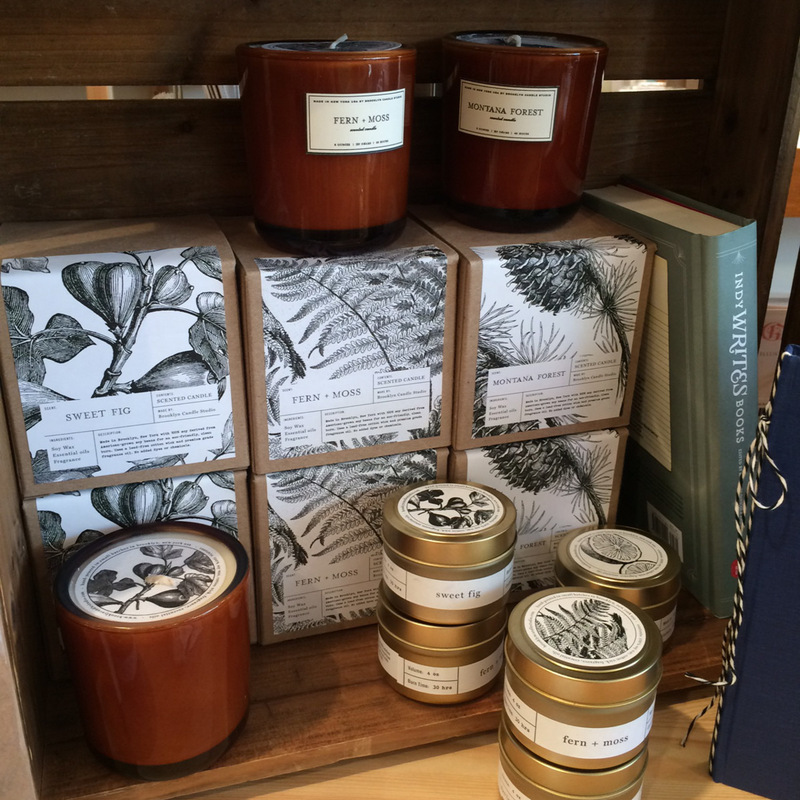 They all smell incredible: candles from new vendor Brooklyn Candle Studios. D’Earth has brought us her all natural bug spray and I have to say it is the best smelling bug spray you’re gonna find, these blank books are new from our neighbors Yonder Bound, lightening bugs abound this time of year and these beautiful ceramic coasters from Linnea Campbell Ceramic Art capture them perfectly, AND we now carry Indy Writes Books! Support your local non-profit bookstore. 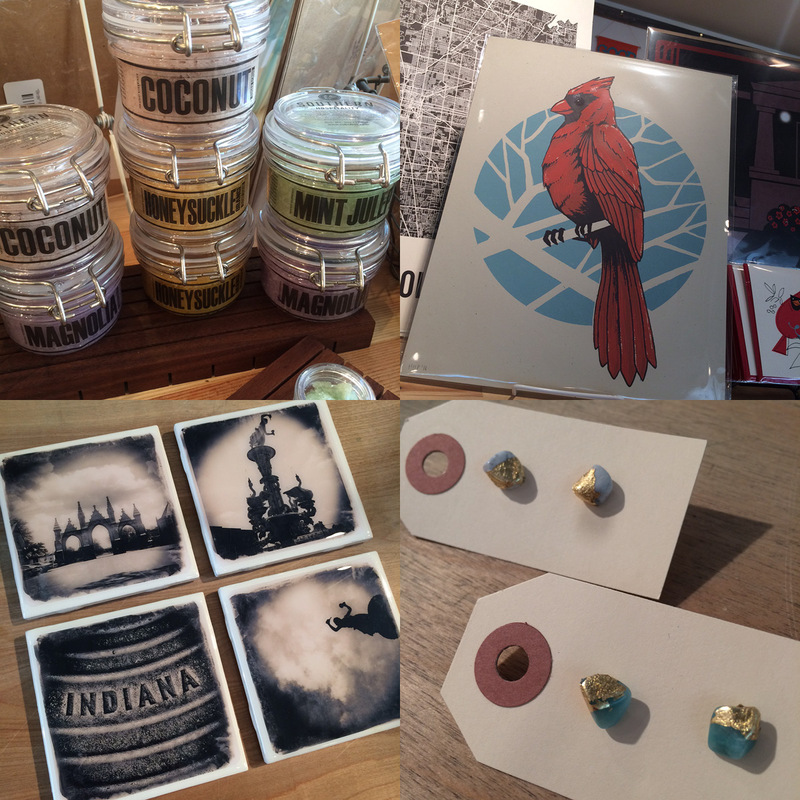 We have a much needed restock from Southern Hospitality including these foot scrubs; beautiful cardinal print by Half Hazard Press, gold flaked studs by Paperish Mess Made, and lots of new photographic coasters from Hazel Brown Photography. 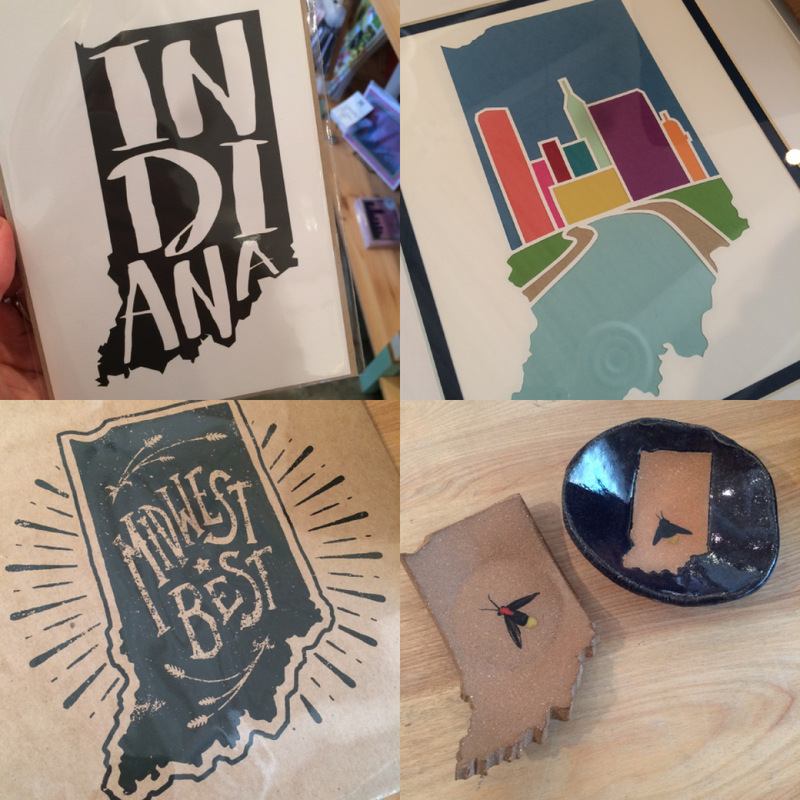 Lots and lots of Indiana love here at Homespun: cards and prints by Haven Paperie, hand-cut paper art by Geez Louise Design, more ceramics by Linnea Campbell Ceramic Art, and Midwest Best print by Half Hazard Press. 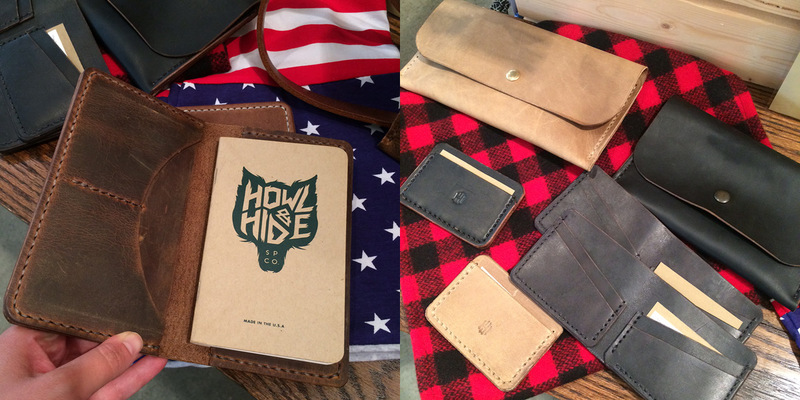 We have a beautiful display of luscious leather from Howl & Hide: these products are useful, durable, and drop dead gorgeous. We’ve got a restock from the ever-loveable Farizula Designs, more Indiana silhouette cutting boards from Dickinson Woodworking and a lovely restock from The Onyx Exchange. LOVE Jen Townsend. 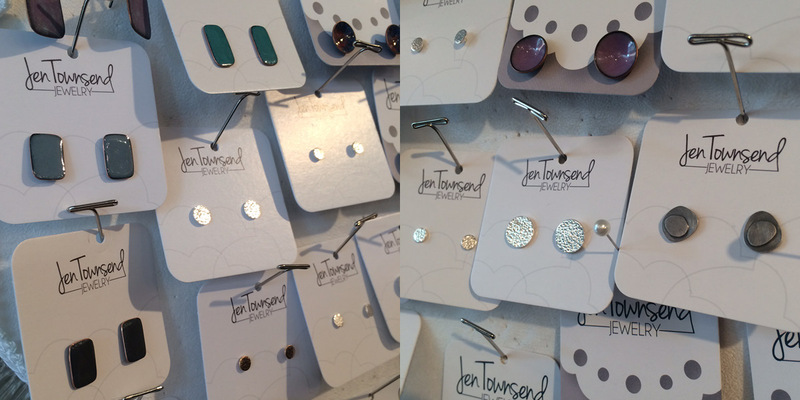 Her beautiful earrings have been a Homespun classic and are so well crafted and beautiful. We’ve got some new styles in to add to your collection. 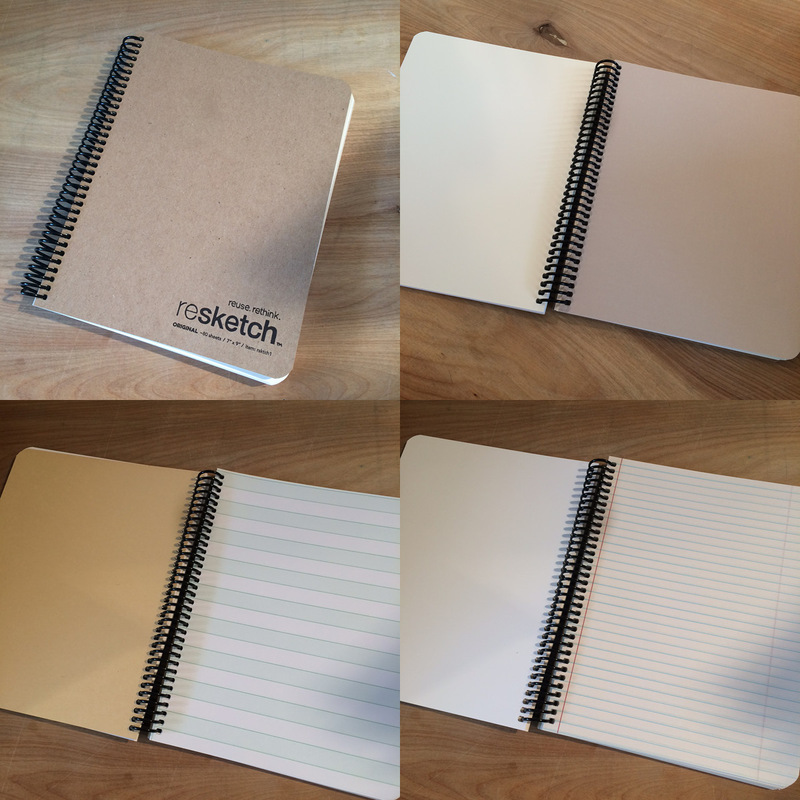 Resketch notebooks divert perfectly good paper from landfills for you to use to much greater purpose. Lots of fun surfaces to create on: new at Homespun. Workshop: Jam! : Friday, June 24th, 10am-2pm AND 4-8pm: NOTE: this workshop will be taking place at a location other than Homespun. Time to kick out the summer jams! Jams, jellies, preserves, and more are a simple, fun way to keep the taste of summer alive all year ’round. Indiana is home to a great variety of wild-grown edibles, and food preservation has long been in our agricultural history. Homespun photographer Rana Salame’s property in Anderson, Indiana is full of blackberries and mulberries, and she’s invited friends of Homespun to her share in her bounty. Participants in this workshop will pick their own berries and process them with Rana’s assistance. Children are welcome – a snack will be served. Bring a basket or bucket for picking and wear clothing that can get dirty or stained. Pants are necessary for working in the thick plant areas. Bring a beverage to stay hydrated. 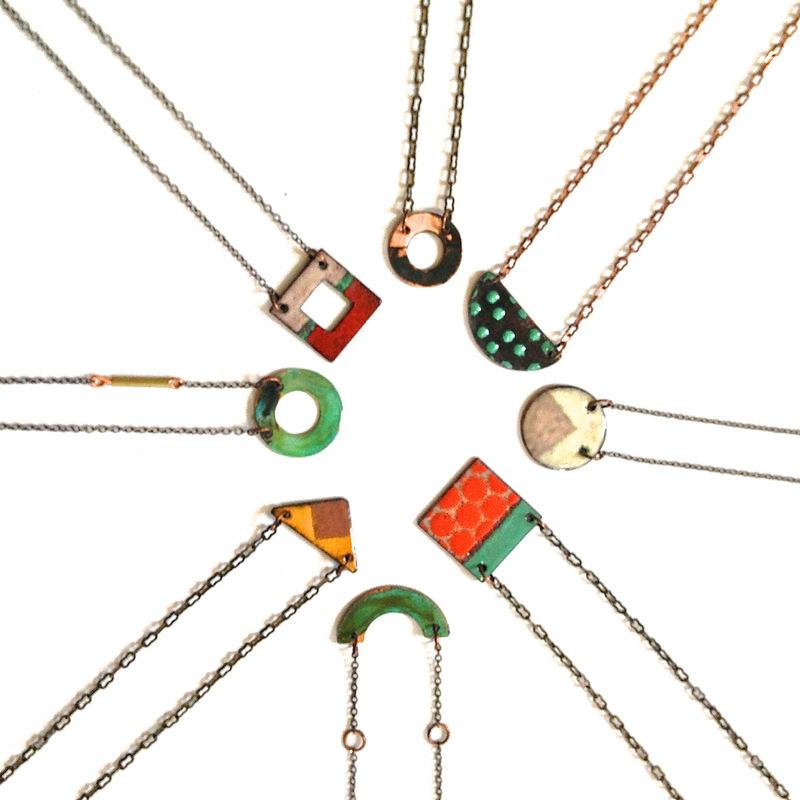 Courtney Fischer Uhrick’s jewelry is the perfect blend of modern and rustic; bold geometric patterns are given depth, romance and a time worn feel by adding patinas and textures to her copper and brass pieces. 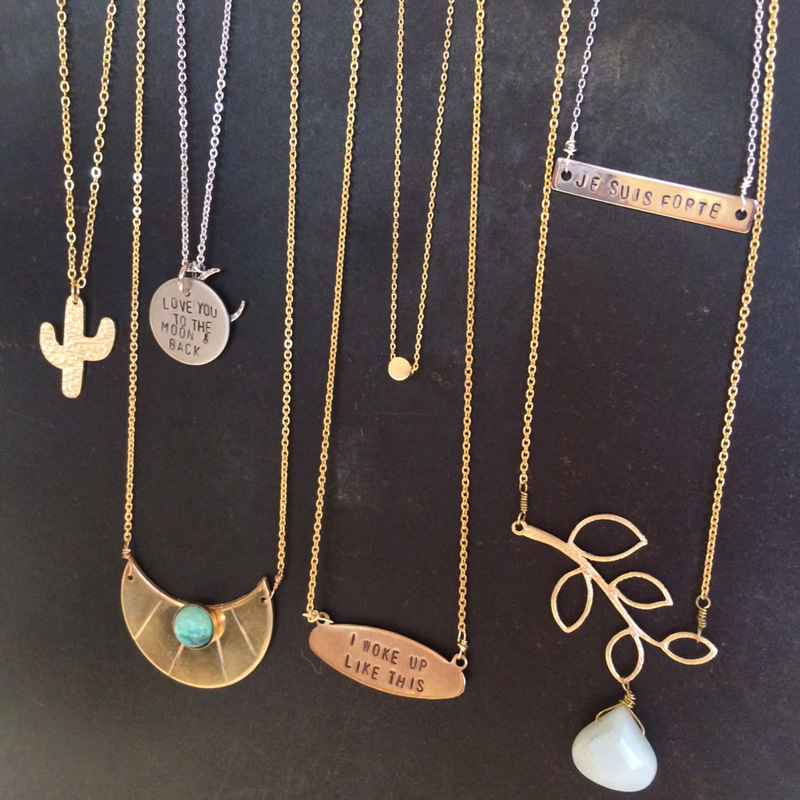 Courtney Fischer Jewelry is a one woman show based in Royal Oak, Michigan. Whether you like simple and understated elegance or bold statement pieces, CFJ has you covered. 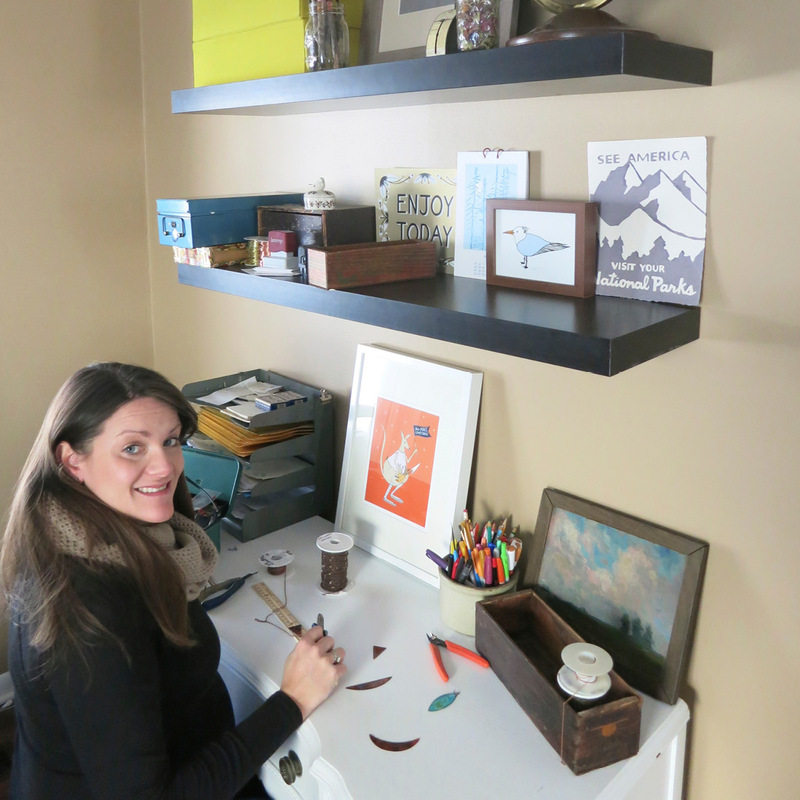 Read to learn more about her unique process and why she loves what she does. That I create handmade jewelry using metalsmithing techniques and that I have a studio in my garage. 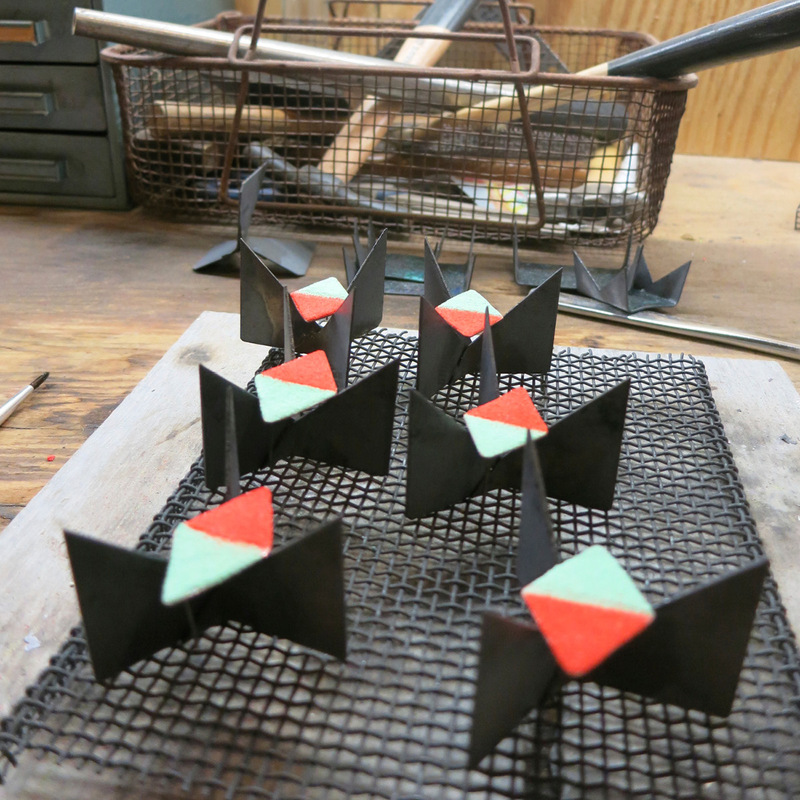 I explain a little about enameling and cutting, filing, finishing a piece of jewelry. I’ve always loved to be creative and I feel like I need to make things to express myself. And it’s fun and rewarding. I love the flexibility and being able to create my own schedule and in turn spending more time with my family. Working for myself gives me a sense of accomplishment. Being a part of the craft community has been a wonderful experience as well. When I started participating in shows and selling in shops, it was so nice to meet like minded people. Sometimes you can feel like you are on an island, making work that you hope people will enjoy and it’s nice to know there are other crafters doing and feeling the same way. When I was in middle school I had the dream of becoming a photographer for National Geographic and always felt that I wanted to do something different than the 9-5. I had the “aha” moment after working for a few years out of college and realizing that people actually wanted to buy things I was making. That gave me a sense of pride and the courage to quit my full time job and that was almost 7 years ago. I work at my house. 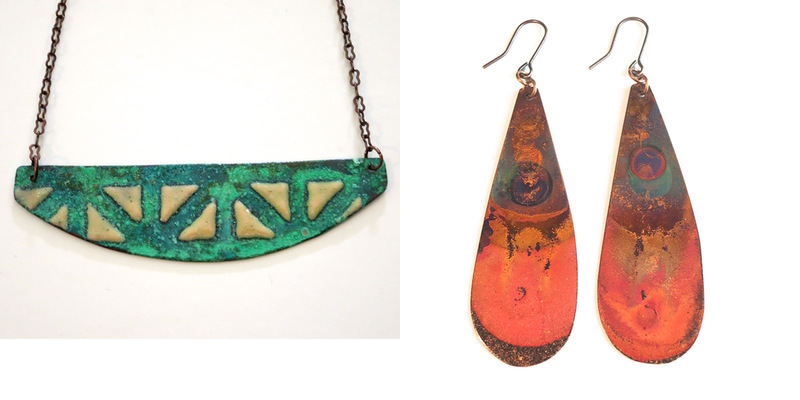 I have a studio in my garage where I do all my metal work, enameling, patina, hammering, etc. Usually while listening to Podcasts. Then I assemble and do all my administrative work inside, also while listening to podcasts. I think I’ve listened to almost every episode of This American Life. 6| If you could swap lives with another artist, who would that person be? The photographer Henri Cartier Bresson, but a woman. He captured the essence of humanity in candid photographs and lived in France. And he lived in a time where black and white photography and developing in a dark room were the norm. There has always been something magical about the process of developing film and prints to me. I think all handmade objects are valuable because someone took the time to create them. But extra value comes from an objects meaning or if you acquired it from someone you love or on a memorable day or trip. A glass bottle made in Murano, Italy that was my Grandmother’s. We travelled a lot together and on a trip to Venice she took me to see the glass blowers and I will always remember that. She had a love and appreciation for art that she passed down to me at a young age. I love camping and being outside and would love to have land someday in northern Michigan to have lots of animals running around. I’ve been to 18 countries and love to travel. I can eat a can of sour cream and onion pringles or a box of Girl Scout Samoas in a very short amount of time. 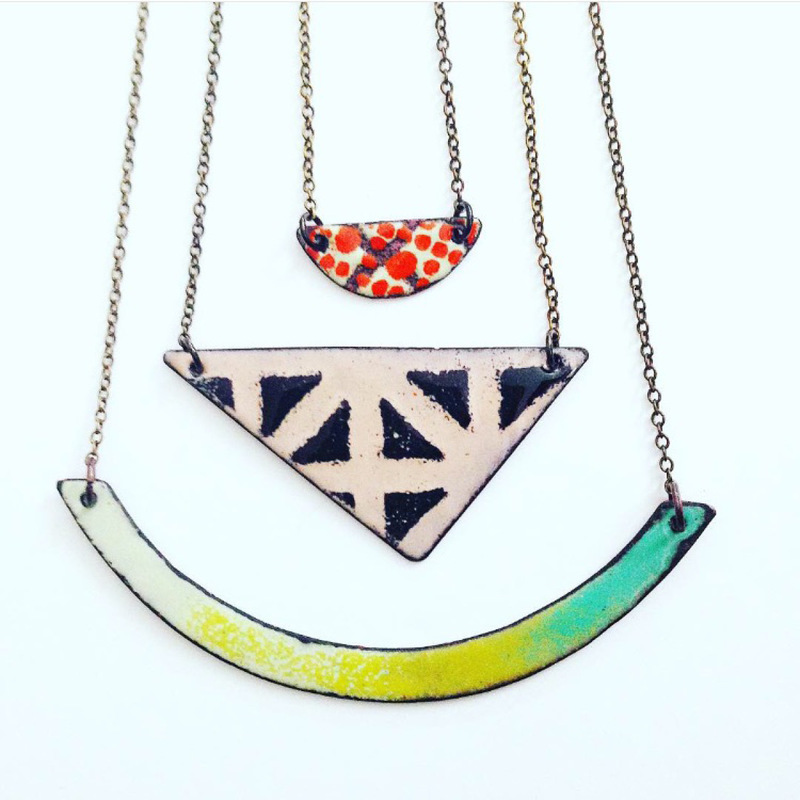 11| What does the enameling process entail? And how do you achieve the patina effect? 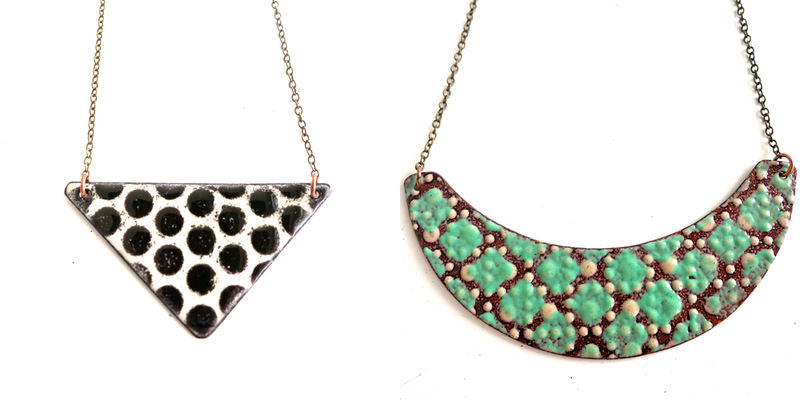 Just to be clear, patina is the blue-green color on your pieces and enamel comes in any color, correct? Enameling is the process of firing glass on metal. First step is preparing your metal. I hand cut, file, drill, and clean all my own pieces. Second step is applying the enamel, which is a similar texture to flour, onto the enamel. Then you carefully place the enamel piece on a trivet (shown in one of the pictures). Third step is place the enamel pieces into the kiln. I fire my kiln at 1600 degrees. Fourth step is filing again to make sure the edges are smooth and then applying patina if desired. Patina is the blue green and enamel comes in a variety of colors, there is a set color sheet I think it’s roughly 50 or so colors. I use a variety of ways to create my patina using recipes that I’ve tried over the years and apply in numerous layers. 12| What is your design inspiration for the shapes and patterns in your line? My design and inspiration comes from color and nature. I love to be outdoors and nature is a main source of inspiration. Also, I was an Art History major in college at IU and am influenced by different styles of art and color theory. 13| Many of your pieces are reversible, that is so unique! How did you come up with that idea? As for reversible, when enameling your piece is stronger if you enamel both sides and I thought, why not make it aesthetically pleasing as well as functional. Want to see more? Check out Courtney’s jewelry here at Homespun: Modern Handmade at 869 Mass Ave in Indianapolis, IN or check her out on Facebook or Instagram. Dads: because you wouldn’t be here without one! It’s just true. Plus, they are usually in possession of a variety of skills such as: lifting heavy objects, administering valuable advice at critical moments, repairing all things mechanical, grilling delicious meats, pumping up bicycle tires, and telling funny (or not quite so funny) jokes. What skills does your dad add to this list? 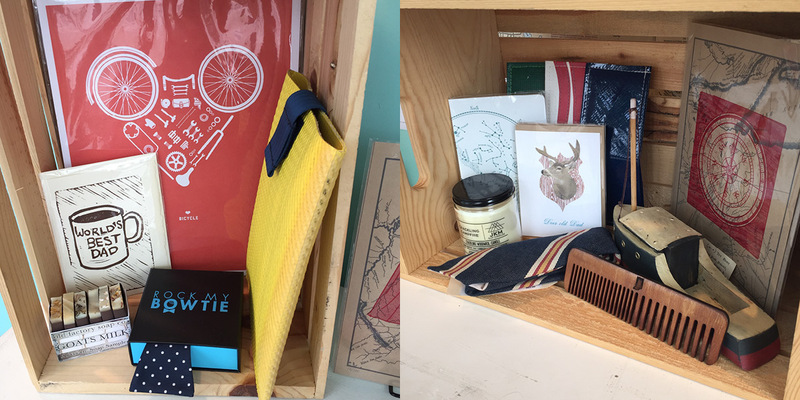 Whatever they are we have some great handmade goodies to add to his hopefully relaxing Father’s Day- which is, as you know, this Sunday the 19th! Our lovely staff will be happy to guide you towards just the right thing, and you can catch a glimpse of some of our great options below. 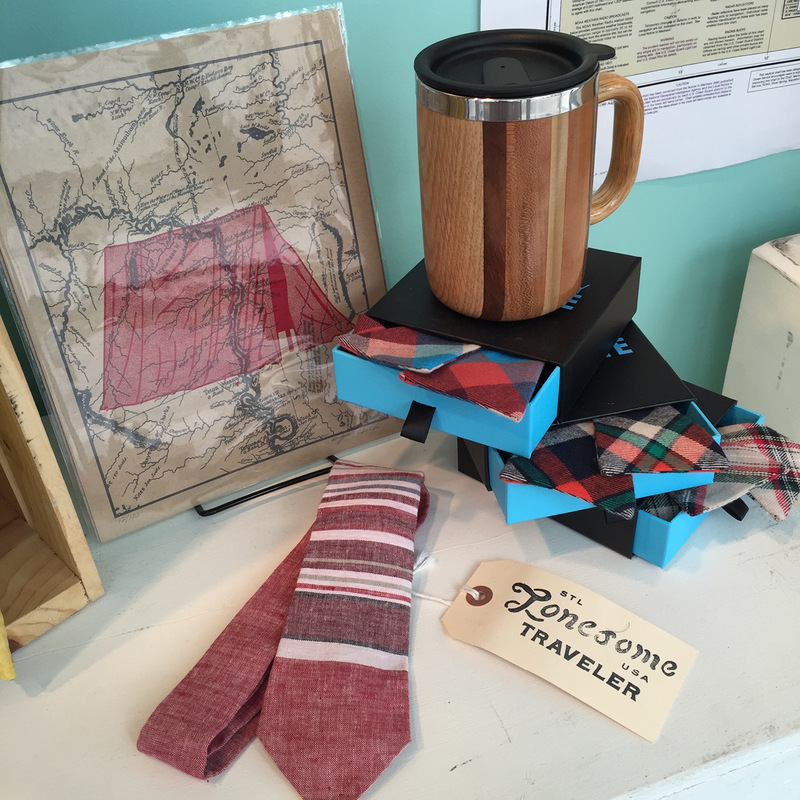 Tent print by Arsenal Handicraft, bow ties (and if your guy is into bow ties, we have a huge selection) by Rock My Bow Tie, tie by Lonesome Traveler and mug by Dickinson Woodworking. On the left: card by Wry Goods, print by Ello There, iPad case by People for Urban Progress, a Rock My Bow Tie, and soap set by Old Factory Soap Co. On the right: candle by JKM, constellation notebook by Blackbird Letterpress, card by Cracked Designs, wallets by People for Urban Progress, another print by Arsenal Handicraft, “Not A Toy” Boat by 50 Little Birds, wooden comb by Mini Fab, and another tie by Lonesome Traveler. 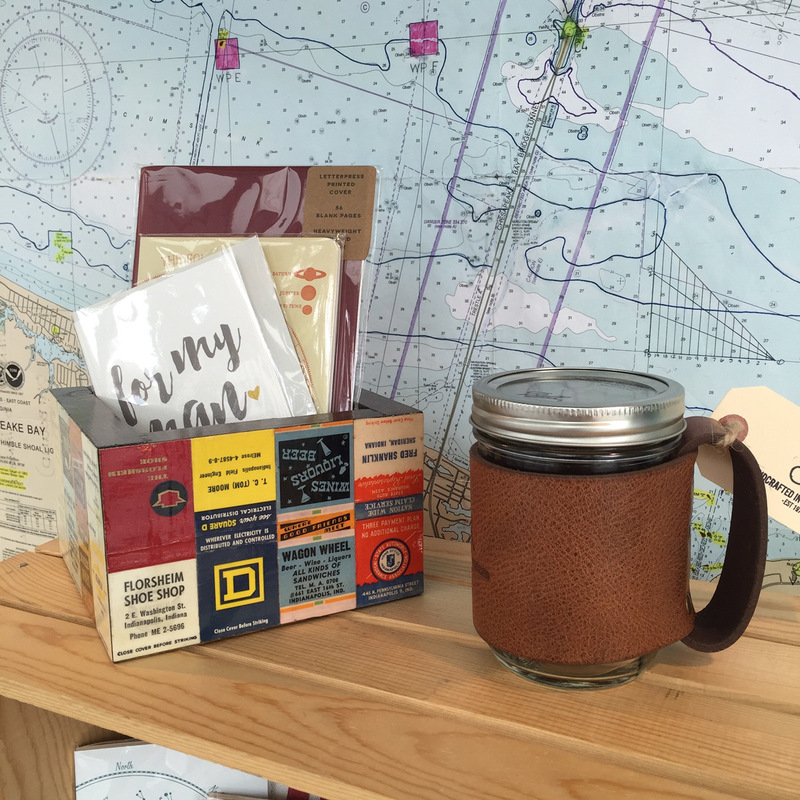 Selection of cards and notebooks displayed in a vintage matchbook box by Indyardart, and leather jar cover my LM Products. 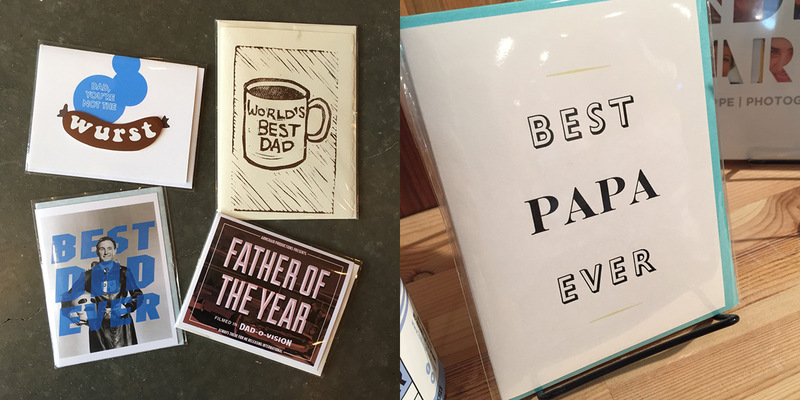 Just a few of our great Father’s Day cards by Wry Goods, Alternate Histories, Cracked Designs and Iron Leaf Press. 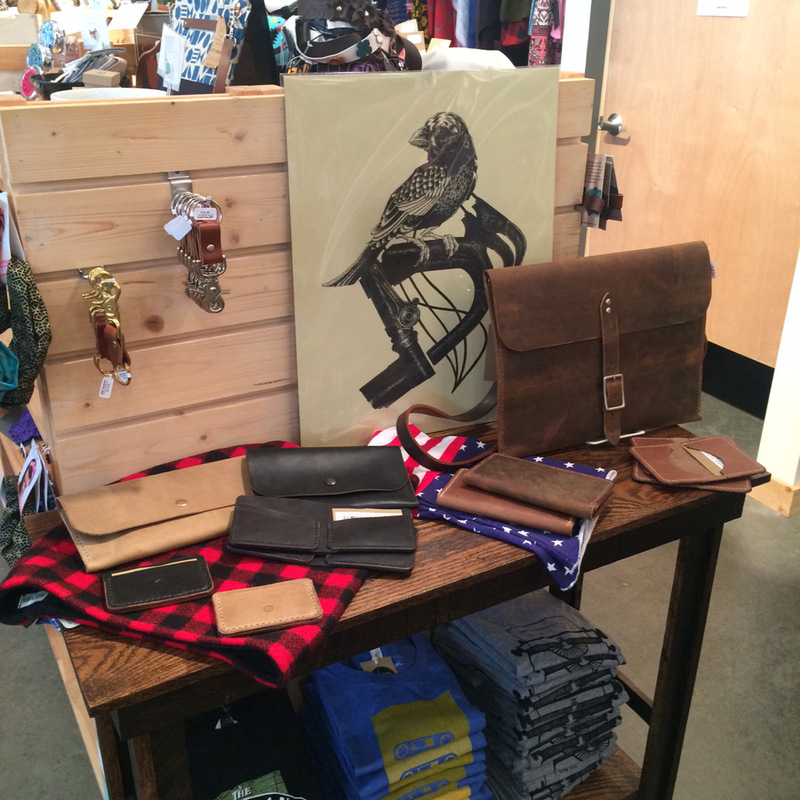 On the left: print by Ello There, bullet or wine bottle carrier by Circle City Growlers, and Johnny Appleseed tee by Yonder Clothing Co. On the Right: another great card by Cracked Designs. 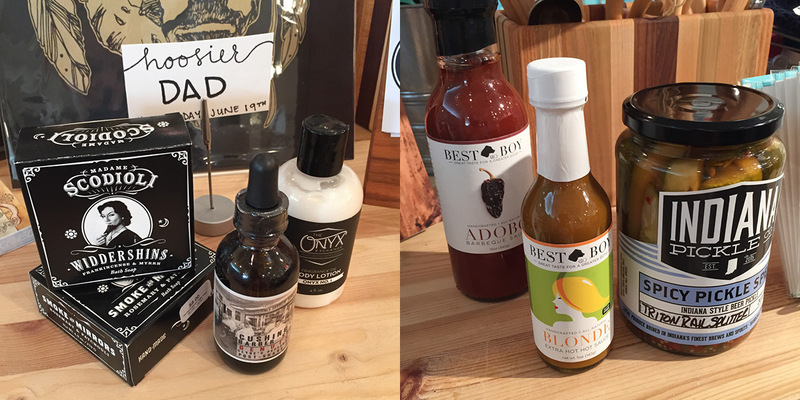 On the left: we have a huge selection of self care products for dudes including soaps by Madame Scodioli, Cushings Barber Shop beard oils, and lotion by The Onyx Exchange. 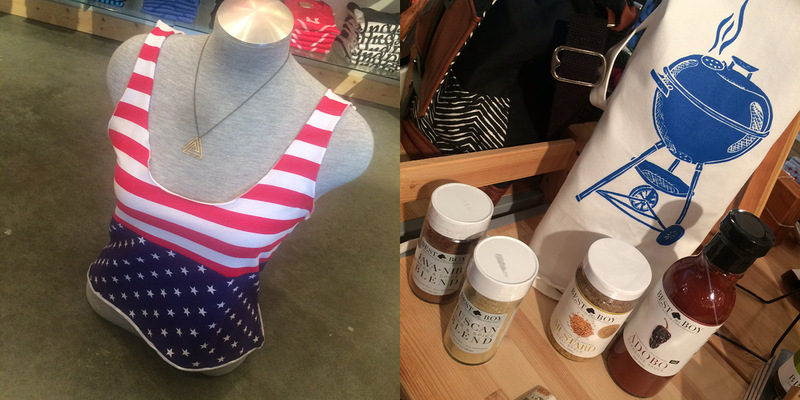 On the right: delicious and locally made goodies by Best Boy and Indiana Pickle Co.
On the left: print by Quiet Boy Studio. 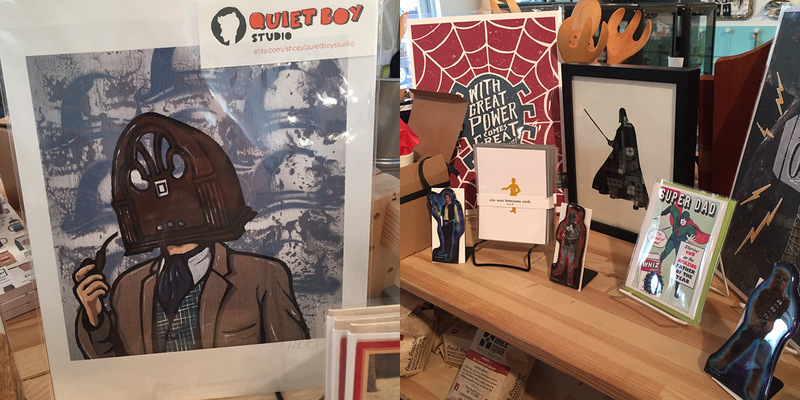 On the right: a selection of goodies for the geeky dad including magnets by Mark Shirar, Star Wars cards by Green Bird Letterpress, print by Quiet Boy Studio, Darth Vader lego art by Smitten by Kat, and Super Dad card by Alternate Histories. 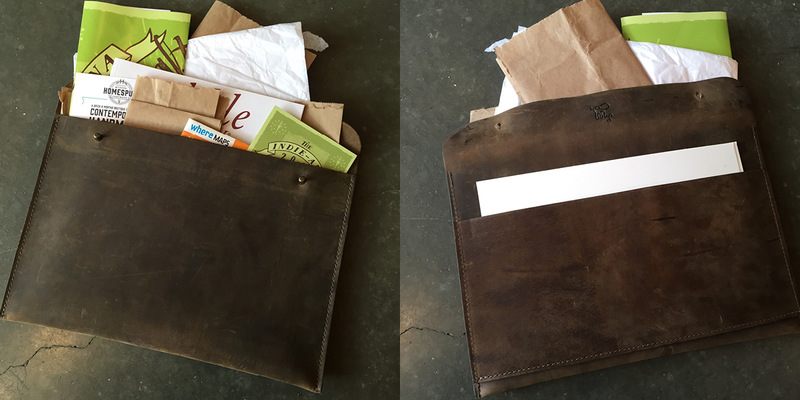 This is such a beautiful leather portfolio, perfect for the professional dad by LM Products. 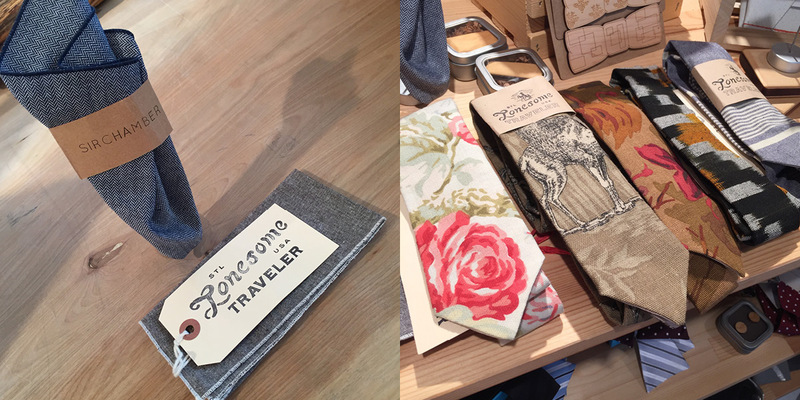 For the dapper dad: pocket squares by Sir Chamber and Lonesome Traveler on the left, and ties by Lonesome Traveler on the right. 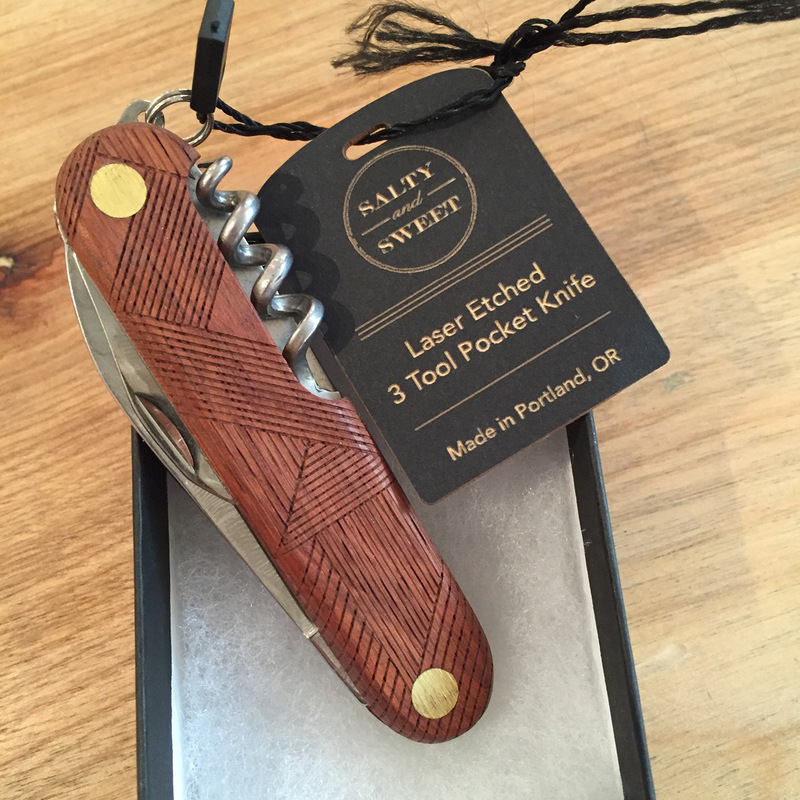 Pocket knife by Salty and Sweet. 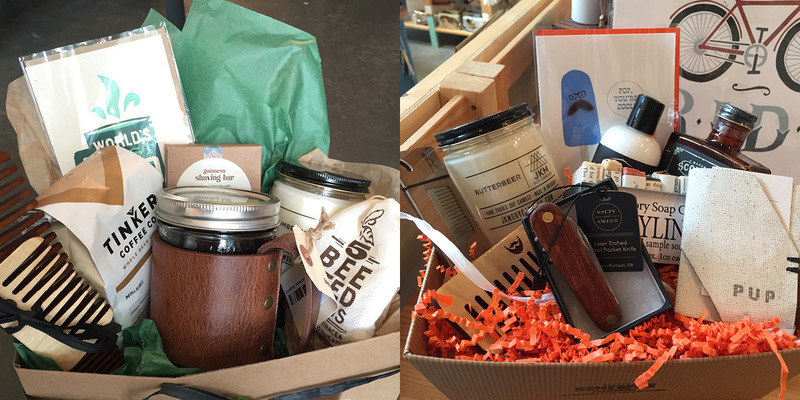 We can put together gift baskets with your dad in mind! Just ask.